The Reds’ failure to sign Virgil van Dijk has left them short at the back, but Klopp doesn’t believe new faces will appear in the upcoming window. LIVERPOOL BOSS JURGEN Klopp has played down the prospect of new defenders joining the club in the January transfer window. The Reds failed in their attempts to sign Virgil van Dijk from Southampton in the previous window and the strength in depth of their defence has often been scrutinised in the months that have followed. However, they have shown a more resolute side since a 4-1 defeat to Tottenham in October, conceding just one goal from open play in their nine Premier League matches following that Wembley thrashing. The defensive improvement means Klopp could consider putting off transfer plans until the end of the season. “Everything we are doing has influence on our plans,” he said, ahead of Friday’s trip to Arsenal. “That’s all I can say about that. “When we win a game and when we defend well, then I’m happy about it. If we defend not that good as a team, then I’m not happy about it, but I don’t then think the solution is a new player always. “It’s really rare that I read. But, for example, Alberto Moreno did fantastic this season and then we played at Sevilla and he played not well. People didn’t hesitate to say: ‘That’s why we need a new left-back’. And I think: ‘Wow’. “But thank God, I – or we – here make the decisions and nobody else. We are not relaxed, but we have a view on everything and it needs to fit together and everything needs to work out in the end and you need to have solutions for different situations, systems and all that stuff. 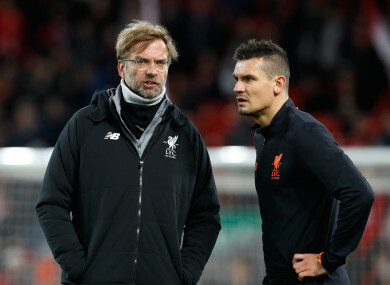 Klopp could be facing defensive worries at the Emirates Stadium, though, with full-back Moreno still sidelined with an ankle injury and Joel Matip still short of full fitness. “Joel Matip was back in training yesterday [Tuesday],” Klopp said of the centre-back, who has missed Liverpool’s last four league matches. “I’m not sure if he’s ready for Arsenal, but the for the games coming up, pretty sure. That’s it, I think. Email “Klopp plays down the prospect of strengthening Liverpool defence in January ”. Feedback on “Klopp plays down the prospect of strengthening Liverpool defence in January ”.